Grand Hyatt Singapore’s award-winning mezza9 is the mother of all international buffets. It is our all-time favourite dining spot in town, and the chefs never ever disappoint. For New Year’s Eve, mezza9 is launching a carefully curated lavish buffet spread featuring Chinese, Japanese, Thai and Western cuisines. You can also look forward to a sustainable crustacean bar, artisan charcuterie, a premium selection of cheeses, decadent desserts and more. Other than mezza9, you can also dine in style at other restaurants in the hotel such as StraitsKitchen, Pete’s Place, 10 SCOTTS and Oasis Restaurant. There is indeed no other better place than Grand Hyatt Singapore to celebrate Christmas and New Year’s Eve in style! The highlight of this year-end extravaganza is the Belle Époque countdown party. Held at Grand Hyatt Singapore’s grand lobby, you can indulge in free-flow non-alcoholic and alcoholic beverages including Perrier-Jouët Belle Époque vintage champagne. The spacious international buffet restaurant is helmed by Chef Martin Satow who is a strong believer of sustainable seafood. Six open and theatrical kitchens await and each station is fronted by its own talented team of chefs. Watch them up whip up a storm and serve you the best and freshest ingredients. From Blue Swimmer Mud Crab, Fine de Claire Oysters, Maine Lobsters, Red King Crabs, Spencer Gulf King Prawns, Scottish Brown Crabs, South Patagonian Queen Scallops, Tasmanian Blue Mussels to Vietnamese Lala Clams, the options at mezza9′s seafood bar will spoil you silly. Continue your seafood rampage at the Japanese live kitchen, where you can feast on sustainably sourced fishes served in the following styles—sashimi, sushi or smoked. Sink your teeth into unlimited portions of Hot Smoked ‘Galway Bay’ Salmon, superbly fresh Yellowtail Kingfish Sashimi, Yesso Scallop Sashimi and Norwegian Atlantic Salmon Nigiri etc. For elderly parents and in-laws who prefer Asian food, they will be pleased to discover that mezza9 boasts a plethora of authentic Asian delicacies. Think Chinese Roast, Double-boiled Soup, Wok-fried Meat, Thai Barbecue and of the like. Do not miss out the Chinese Red Garoupa Fillet—this succulent white fleshed fish is steamed with black garlic, Chinese wine and soy sauce. It was the epitome of comfort food amidst luxury. The expanded Thai kitchen has rolled out several tantalising Thai classics, namely Gai Yang, Isaan Sausage, Moo Yang and Som Tam. The resident Thai chef’s interpretation of Gai Yang is basically a Thai-style chicken thigh marinated with honey and pandan and grilled till tender. Loosen up the belts and it’s time to stuff yourselves further with mezza9′s spit roast and grills. Watch in awe as the in-house rotisserie roast the British Red Poll Prime Rib in front of you. You can also expect aromatic superior meats grilled over yarrah hard wood, i.e. Grass-fed Lamb Saddle, Free-range Dingley Dell Pork Rack and Free-range Corn-fed Chicken. Having wine and cheese is a wonderful way to unwind after a long day. Cheese connoisseurs can savour different cheeses of various origins such as Littly Lily from the UK, La Tur from Italy and 24-month Comté from France. Eat these cheeses together with the array of gourmet charcuterie—chorizo, duck rillette, game terrine and iberico ham. Of course, no celebration is complete until the desserts are served. Lo and behold, as we present to you, the prettiest homemade ice cream available in the following flavours: Chocolate, Pistachio, Salted Caramel and Strawberry Cheesecake. The buffet is inclusive of free-flow selected soft drinks, juices, tea, coffee, beers, cocktails, red/white wines, prosecco and PJ Grand Brut Champagne. Price: S$298++ per adult (with alcohol), S$148++ per child (ages 4 to 17). For a uniquely Singaporean festive buffet, StraitsKitchen features authentic Chinese, Malay and Indian dishes whipped up in Halal-certified kitchens. The highlights include lobster masala, sikandari raan (lamb leg seasoned with Indian spices), Malay oxtail soup, baked salmon in brioche and roasted duck rolls in egg pancakes. Price: S$188++ per adult (with alcohol), S$138++ per adult (without alcohol) and S$98++ per child (ages 4 to 12). Over at Pete’s Place—one of the oldest Italian restaurants in Singapore—you can expect an Italian feast with antipasti, sustainable crustaceans, pastas, risottos and wood-fired pizzas, oven-baked porchetta and roasted Australian grain-fed beef rib eye. Price: S$188++ per adult (with alcohol), S$98++ per child (ages 4 to 12). 10 SCOTTS will feature a communal-style array of highlights such as sustainable sashimi, freshly-shucked oysters from the crustacean bar, an extensive appetiser buffet and grass-fed Australian roast beef and Chinese roasted duck with pancakes. The poolside restaurant’s barbecue dinner will fire up selections such as spicy gai yang chicken, beef sirloin, lamb cutlets and more. Price: S$98++ per adult (with alcohol), S$48++ per child (ages 4 to 12). 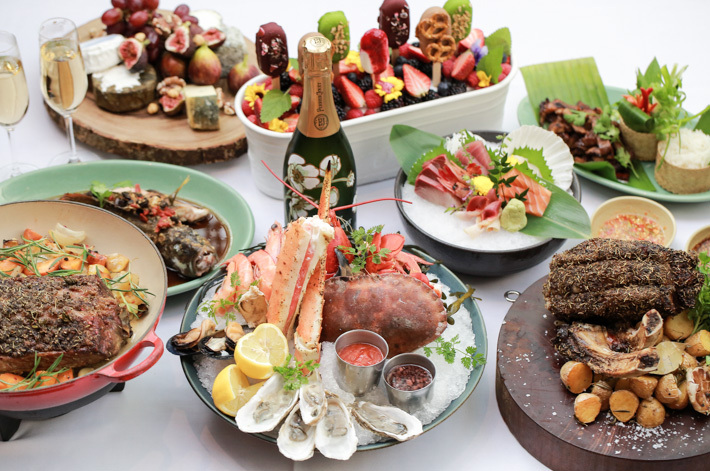 Now that you are done with mezza9′s scrumptious festive feast, head down to Grand Hyatt Singapore’s hotel lobby and join the Belle Époque countdown party, where you get to continue indulging in free-flow desserts and champagne. What a way to usher into 2017!